I’ve spoken of my…struggles…with pumpkin. Savory gourd I can hang with. Sweet, not so much. However, if Trader Joe’s is to be believed, I am in the very slim minority. Not sure if anyone caught this but nearly every single item in their latest frequent flyer news letter was pumpkin-ified. Pumpkin yogurt. Pumpkin macarons. Pumpkin body butter. Now I know those guys at TJs like to have some fun but they wouldn’t make it if it didn’t sell. And this is why I have not one, but two pumpkin recipes this month. 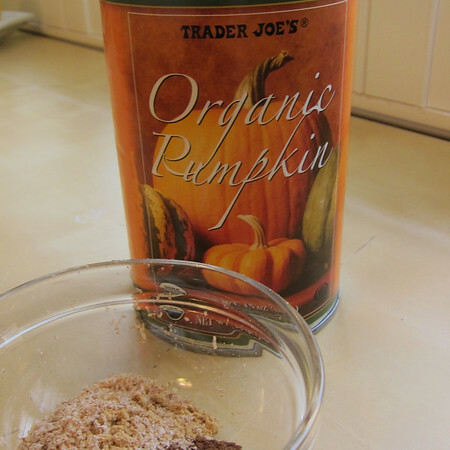 Everyone’s favorite fall spice profile marries with pumpkin, oatmeal, white chocolate and pepitas. While these aren’t exactly healthy, I bet you could eat half a dozen for the same number of calories in in tall pumpkin spice latte. 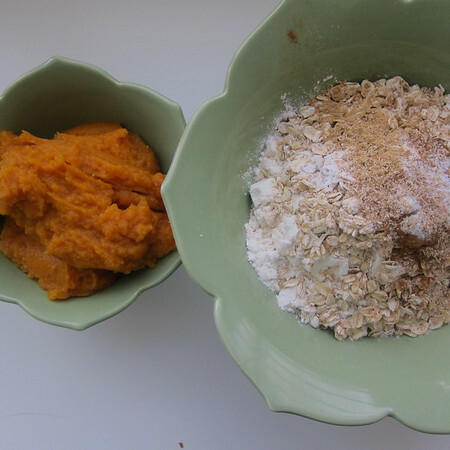 Whisk the flour, oats, baking powder, cinnamon, ginger, salt, and nutmeg in a medium bowl to break up any lumps; set aside. Fold-in chocolate chips and pepitas. Drop 8 dough rounds per baking sheet by the scant 1/4 cup, staggering them 2 inches apart on the prepared sheets. Place the baking sheets on wire racks and let the cookies cool on the sheets for 3 minutes. Using a flat spatula, transfer the cookies to the wire racks to cool completely. Repeat with the remaining dough using cool baking sheets. 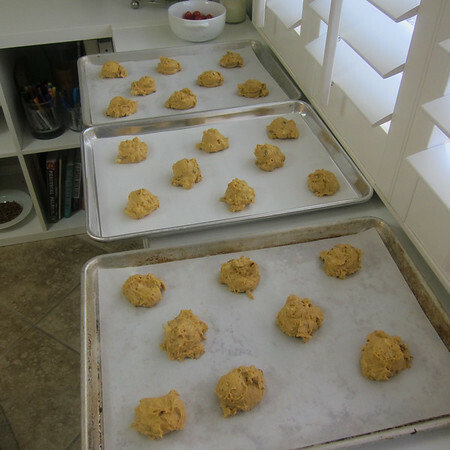 Place all of the cooled cookies on cooling racks or parchment. Dip a fork into the glaze and drizzle it over the cookies in a zigzag pattern. 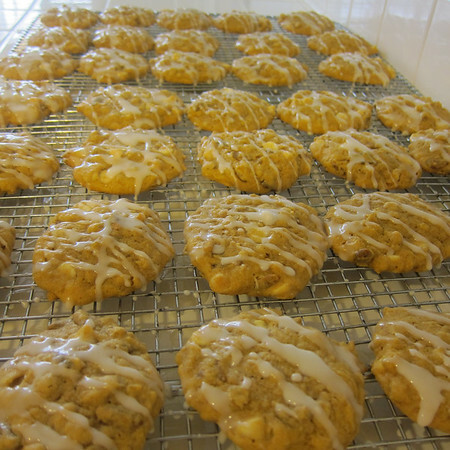 Let the cookies sit at room temperature until the glaze has set, about 20 minutes. Pumpkin it seems, is all the rage this fall. So much so that I’m surprised Pinterest hasn’t added it as a category. The funny thing is that I kind of think it’s actually the spice profile people love about pumpkin and not the actual gourd itself. 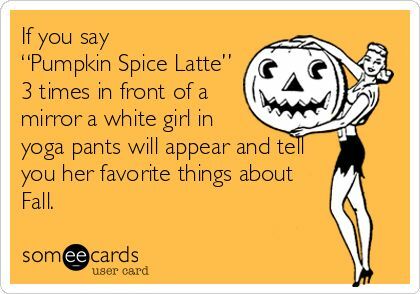 Of course, I’m basing this off of the fact that Starbucks’ pumpkin spice latter doesn’t actually have any pumpkin in it. Or maybe it’s my well documented “not love” for all things squash coloring my belief that anyone could love pumpkin as a food. But what can I say, I’m a sell-out and felt obligated to include at least one pumpkin-based goodie in my baking line-up this fall. 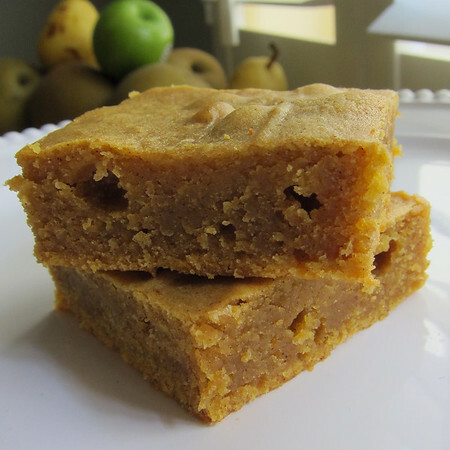 This pumpkin blondie, while not exactly healthy, is a little less indulgent than, say, a regular blondie. The pumpkin replaces about half of the butter and eggs without missing a beat. And while these are just fine as is, I think this recipe begs for additions. How about some roasted pepitas? 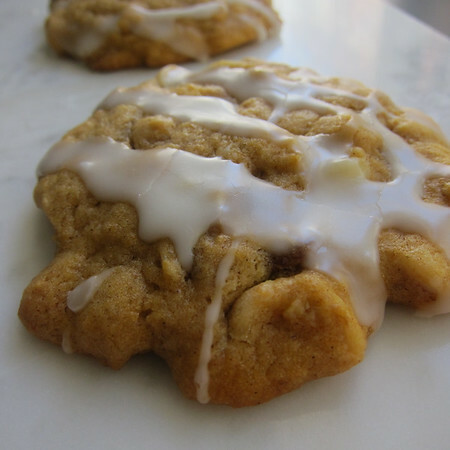 Extra white chocolate chunks…ooh…or maybe some butterscotch chips? If nothing else, I recommend a dusting of powdered sugar before serving these very autumnal squares. Preheat oven to 350 degrees. Line 9X13 inch baking pan with parchment, butter pan and parchment. In a medium, heavy bottomed sauce pan melt butter over low heat. 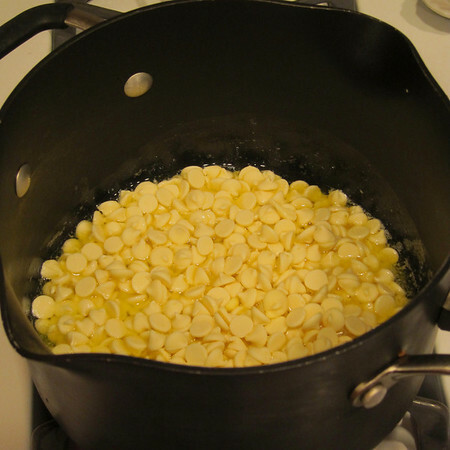 Once butter is melted, remove from heat, add white chocolate, swirl to cover and let sit for 3 minutes. Whisk butter and chocolate together until smooth and allow to cool. In a medium bowl, sift together first 6 ingredients. Set aside. In a larger bowl, whisk together sugars and eggs until combined. Whisk-in vanilla. Whisk-in pumpkin. Then whisk-in cooled buter and chocolate mixture. Switch to a spatula and gently fold-in flour mixture. Transfer batter to prepared pan and cook for 30-40 minutes (they were done at 34 minutes in my oven) until an inserted skewer comes up clean and sides start to pull away from pan. Allow to cool completely. Cut into squares. Split vanilla bean. Add vanilla seeds and cream to a small, heavy saucepan. Heat mixture until the edges barely simmer. Add white chocolate swirling pan until everything is covered with cream. Let sit for one minute. Whisk melted mixture until smooth. Store in fridge until ready to use. Ganache will be very thick and be beaten to add air before piping into macaron shells. Cream cream cheese in a standing mixer fitted with a paddle or hand-held beater. Add-in pumpkin and combined. Mix in confectioner’s sugar .5 C at a time until frosting reaches desired consistency. Start with .5 tsp of spice and add-in until reaches desired taste. Refrigerate for at least 30 minutes before filling macarons. Cream cream cheese in a standing mixer fitted with a paddle or hand-held beater. Add in zest and about half of the lemon juice. Mix in confectioner’s sugar .5 C at a time alternating with lemon juice until frosting reaches desired consistency. Refrigerate for at least 30 minutes before filling macarons.